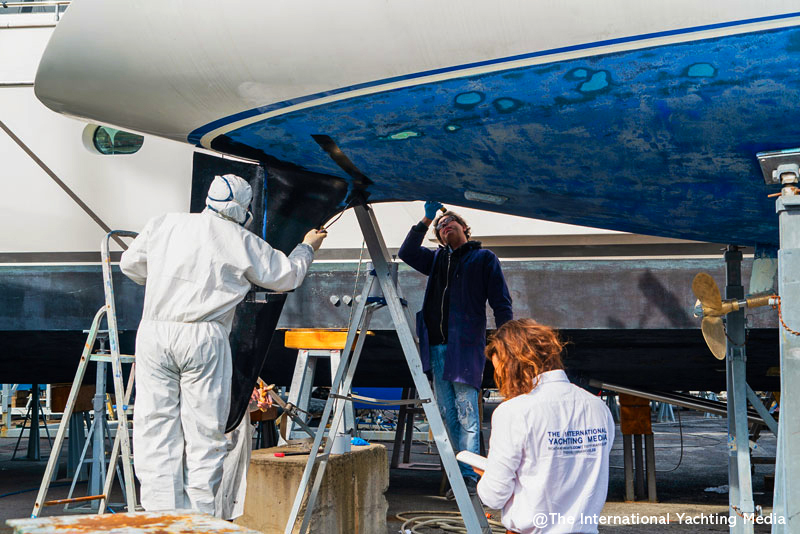 Antifouling has always been a common concern among boat owners. 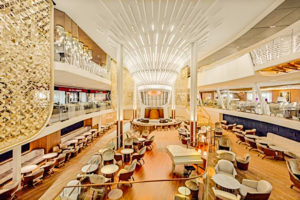 Durability, efficiency and costs are the factors that most affect the choice of the product. We’ve discovered Crystal Boat, a new product that revolutionizes the approach to hull fouling prevention and that, as we will see below, might bring benefits to boat owners in terms of time and cost savings. Moreover, this paint promises to protect the environment because, as being completely devoid of biocides, its environmental impact is practically close to zero. 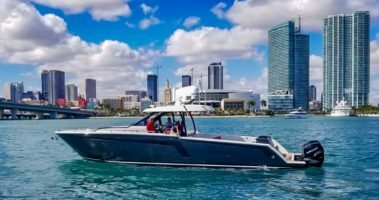 Successfully applied to the hull of many powerboats, Crystal Boats has caught our attention and we have decided to test it in an unusual version on the Daydreamer, the lab-boat of The International Yachting Media. 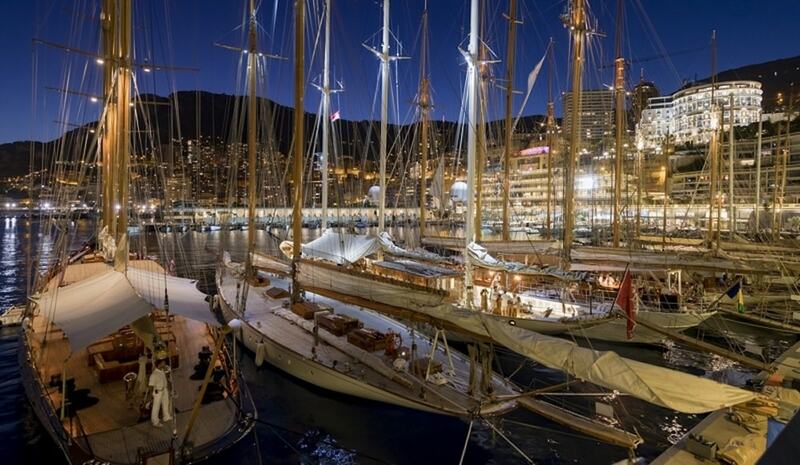 We could describe Crystal Boat as a long-lasting self-cleaning paint. 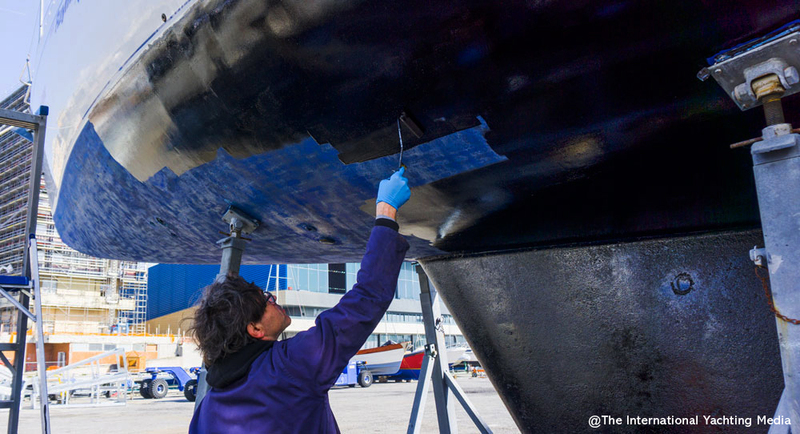 Given its high resistance to exfoliation, the hull is expected not to be repainted earlier than three 3 years. 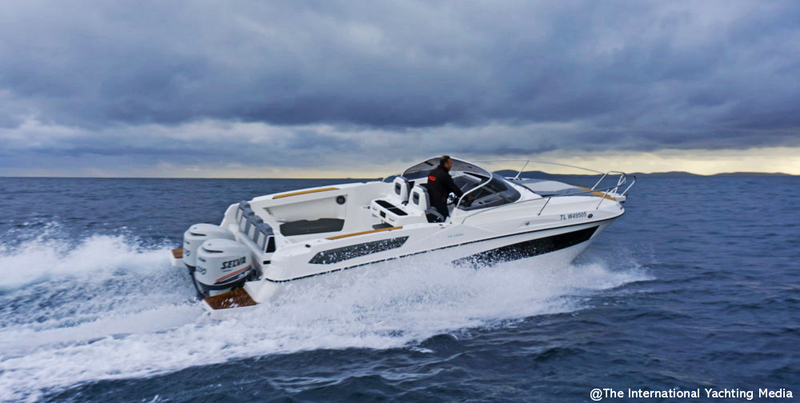 In fact, the application of Crystal Boat on the hull provides a strong smooth slippery hydrophobic surface. It’s therefore for a mechanical reason that Crystal Boat can be used in the same way as a conventional antifouling paint. Thanks to these characteristics, the surface layer of the paint prevents fouling from coming into contact with the hull and, at the same time, thanks to the friction generated by the speed of the boat on the water, facilitates the removal of barnacles and algae that, in the event of prolonged stops, would inevitably end up attacking the hull. 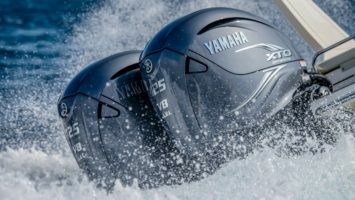 This is why this paint is successfully used on the hulls of motor-powered boats. 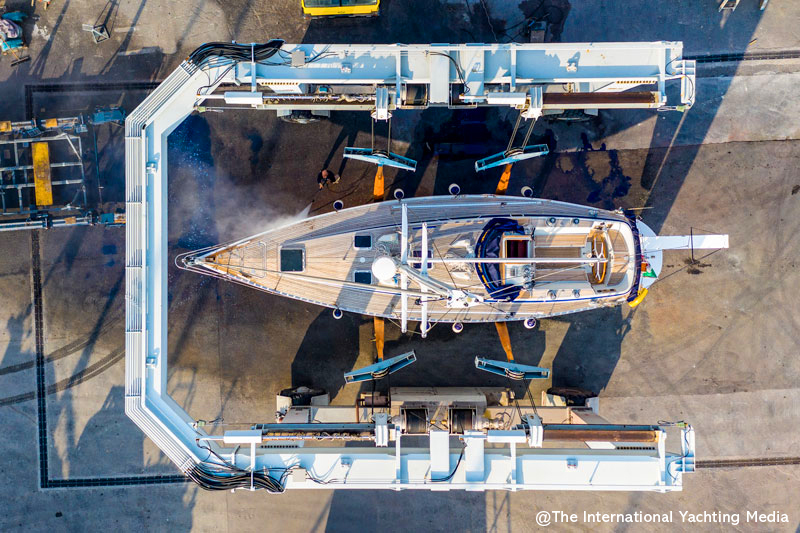 The high speed generated by these yachts during navigation facilitate the self-cleaning process of the hull. However, what we are going to test is the capacity of this paint to be used on sailboats that, of course, are not able to run so fast. Indeed, we wondered if we could “invest” the abrasion resistance and the durability (three years) of this paint through the adoption of a simple monthly cleaning carried out by a scuba diver in the port. Resistant to exfoliation, this paint can be cleaned whenever we want without never compromising its thickness. Most boats sail just six months a year and we’re sure you will have already understood the benefits of this paint both in financial and environmental terms. If, during out test, we see that the speed of our Daydreamer will be enough to clean the hull, then the test will exceed expectations and benefits will be even greater. 2) Anti-galvanic insulation: the paint creates an insulating layer that protects the boat against galvanic currents. Crystal Boat is also certified to handle impacts of up to 45 Newton and resist all types of solvents. 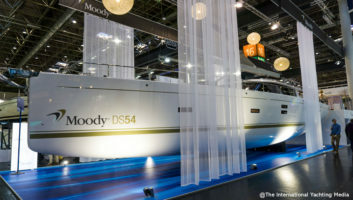 The paint requires just one application on the hull; primer is not required to make the paint adhere to the hull surface. 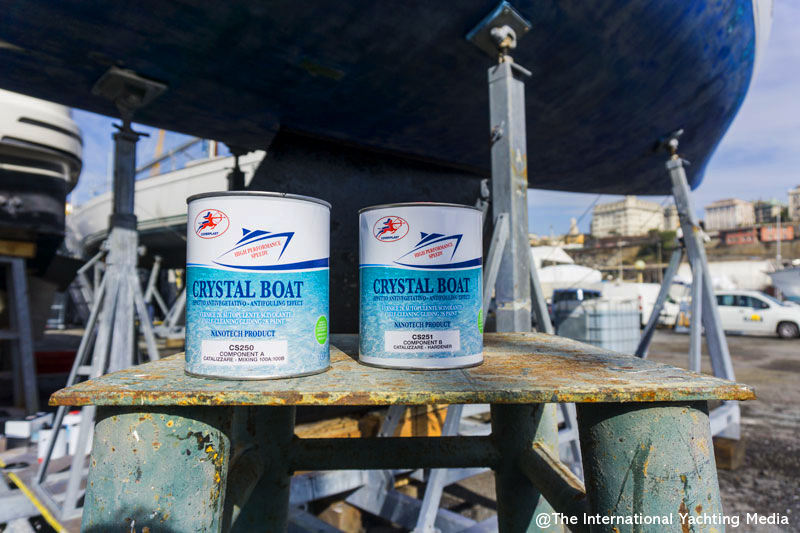 Finally, unlike many conventional antifouling paints, Crystal Boat doesn’t ruin itself after a prolonged contact with air or water. 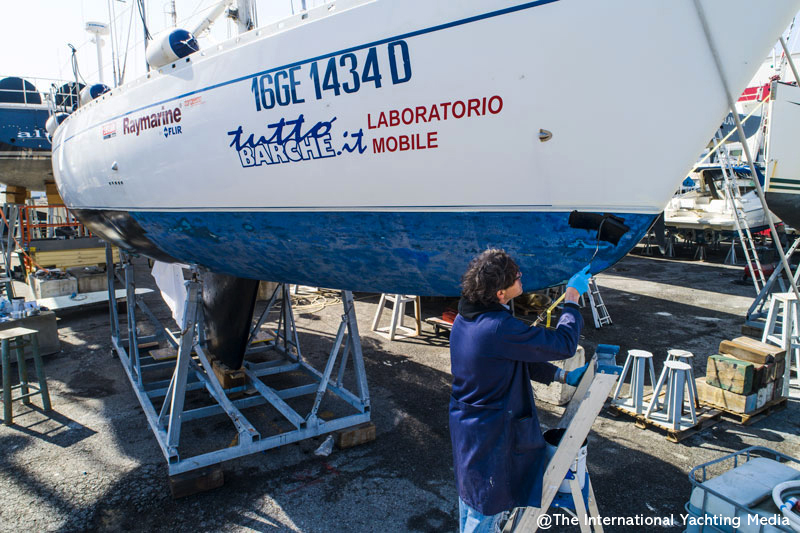 The boats treated with this paint can therefore be hauled and launched an unlimited number of times. 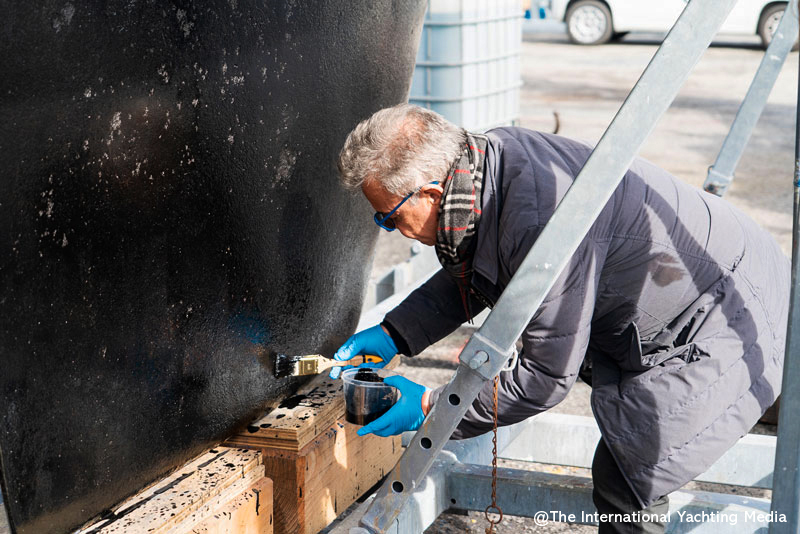 It’s early in the morning when we get Genoa Sea Service in Genoa where Nicolò De Angelis, the head of the shipyard, lets us find the Daydreamer perfectly prepared for our test: the old antifouling paint has been removed and the hull is now ready for a new treatment. 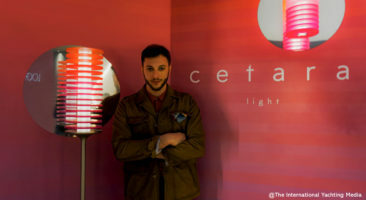 We don’t waste time and, together with Claudio Moltrasio of Coverplast, we start to observe the application of Crystal Boat. The paint requires no diluent and is divided into two components – A (paint) and B (hardener) – that must be mixed in a 1:1 ratio. While t echnicians mix components, we ask more details about the theoretical performance of this paint. We find out that, if the pain is sprayed, the output is 12 m²/L while, if it is applied with a roller brush as in our case, the output is 10 m²/L. After the first coats, we see that the product adheres to the surface very well. 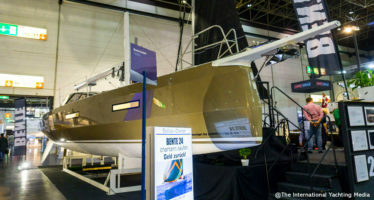 However, we have some doubts about single-coat application: will it be enough to cover the hull homogeneously? 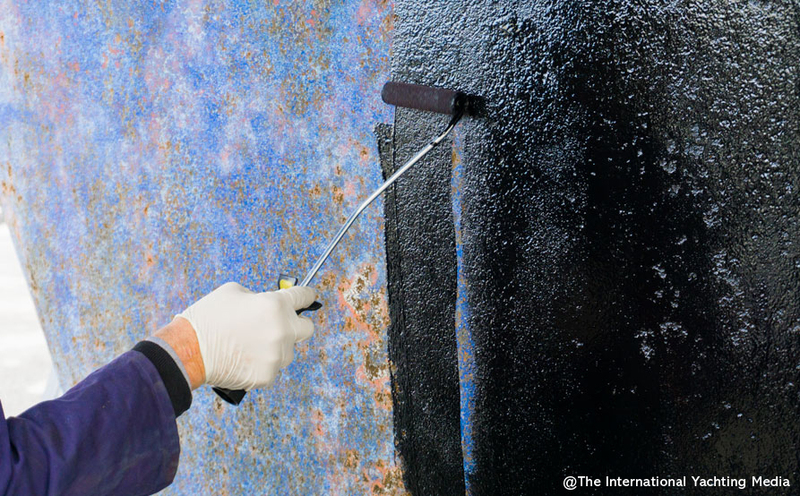 At first it would appear not, but then the paint slowly dries, expands and covers the whole surface, creating a very strong, perfectly smooth “skin”. We opt for an additional coat on some points of the cast iron keel where oxidation has provoked some holes covered with rust. After all, the Daydreamer is over 30 years old! If Crystal Boat was able to act as insulation even on this corrosion points without even one coat of primer, it would be really amazing. But we’ll figure it out only during our next checks. Once the painting process is completed, we see that just a little more than 3 kg of Crystal Boat have been used to cover the hull and its appendages. 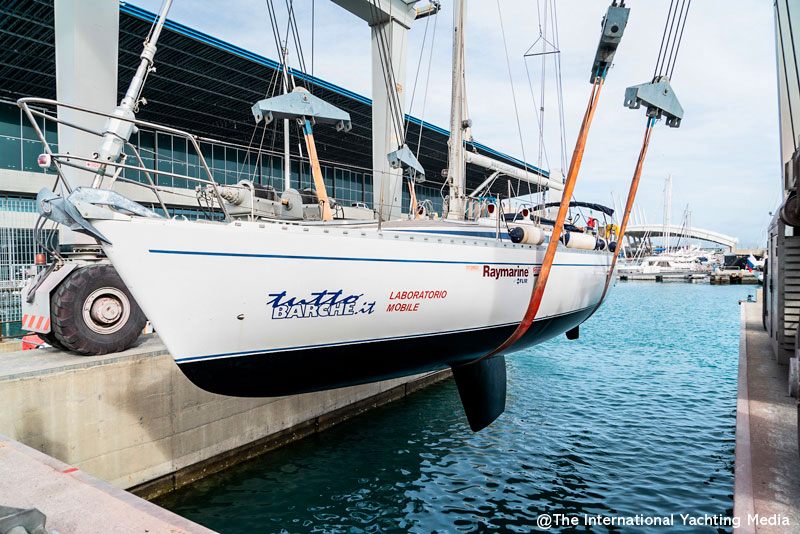 The hull of the Daydreamer measures 34 square meters, so we can say that the paint performance is greater than expected. Once the paint has been applied, we let it dry ( the expected time is 48 hours). 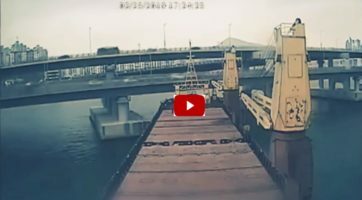 After a few days, we come back and haul the boat. Thanks to this paint, the hull and its appendages seem to have a strong, extraordinarily smooth protective shell on their surface. 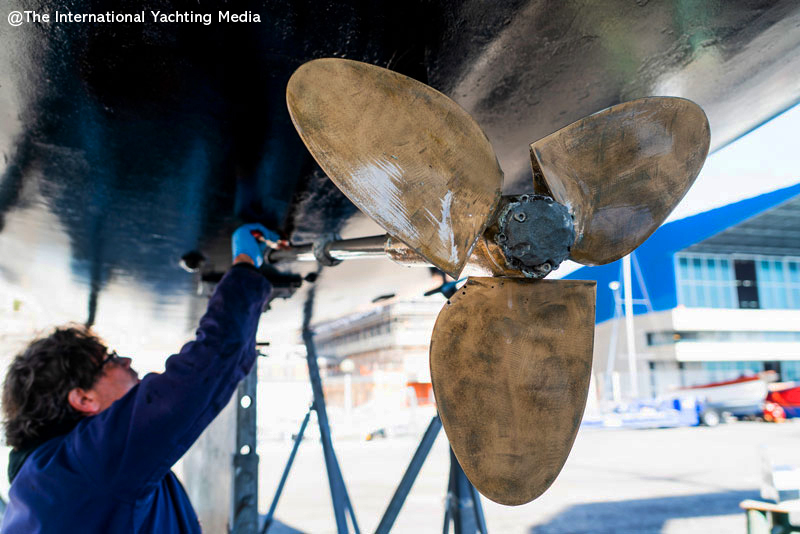 We caress the surface and notice that, unlike many other antifouling paints, the product doesn’t release any traces of colour, our hands are clean and slide almost without friction on the incredibly smooth surface. However, it’s when we start the engine and cover the first miles of navigation that we discover the real surprise. The boat seems to go faster than usual! So, we write down engine revolutions and speed and, after comparing them with our previous notes, we find out that the Daydreamer is a few tenths of knots faster. Another sign, at the end of the first part of our test, of how Crystal Boat is an excellent option even in terms of fluidity. Now, we only have to wait, sail a little and leave the boat on the dock in order to analyze the results and, of course, keep you updated. 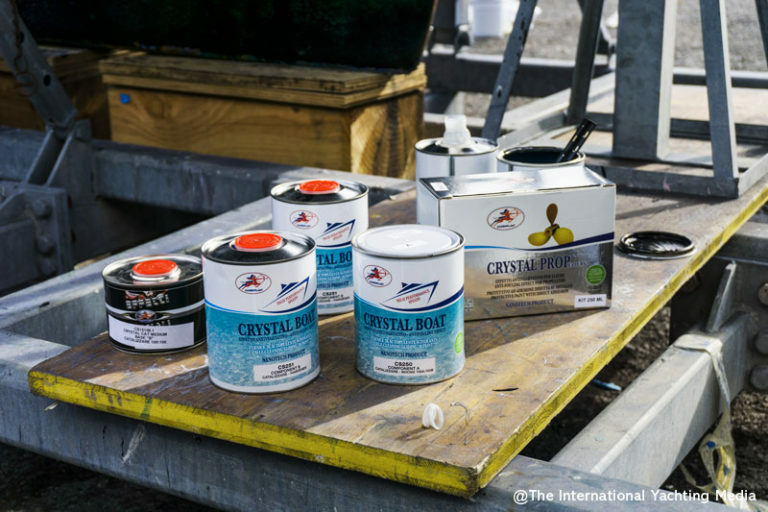 During our test, we have also used Crystal Pro, a specific paint for boat propellers. 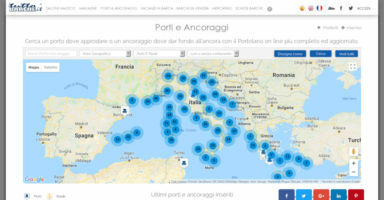 This second product by Coverplast will be the subject of another test to which, in order to avoid confusion, we will soon dedicate another article. 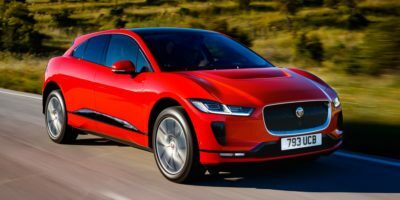 If Crystal Boat test proved to be efficient, how much could we save? 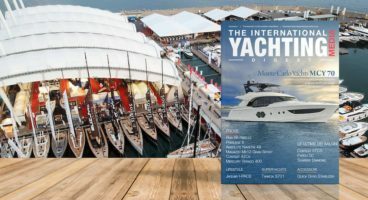 For our chart, we have compared Crystal Boat with a high-performance strong-matrix antifouling paint with a life of one year and two coats of paint required. The Daydreamer is 13.7 meters long and has a draft of about 34 m².